This post has been running through my head for a while now...every since I shared my go to housewarming toolbox gift. 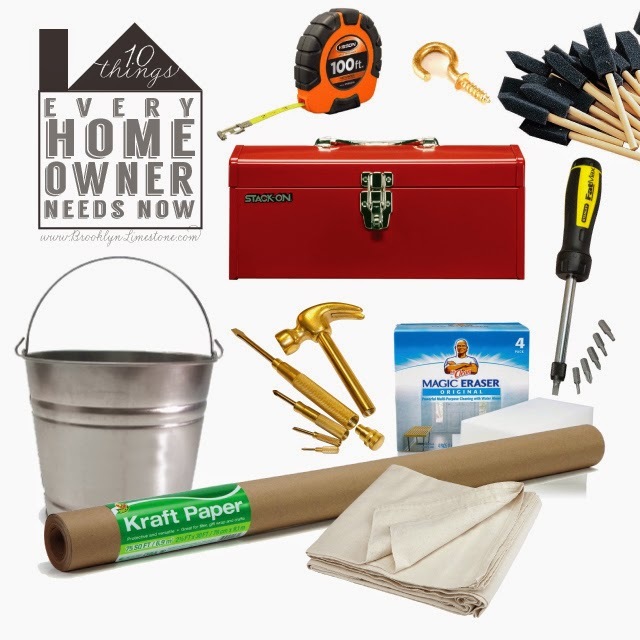 It seemed to me that it took me quite a while to learn just exactly what type of practical items were truly useful for me as a homeowner so it seemed something worth discussing. So here is my list of top 10 practical items I think are must haves. What do you think? What items would you add to the pile? take away? A long tape measure - even if your house isn't that large, you will need one of these eventually. Obviously you can use it for smaller projects too. While you are at it, get 10 more cheapo tape measures in all sizes. Like socks, these things have a tendency to grow legs and run away. Cup Hooks - This one might seem like an odd must have but I will tell you that I bought a 100 pack ages ago and I have used them so often I had to buy more. They are cheap and super easy to install with a twist, you can't go wrong having them around. Eye hooks are pretty awesome too. Cheapo paintbrushes - even if you don't have big painting plans in store, having a little cache of these babies is always a smart idea. You'll need better paint brushes for larger DIY projects but I never seem to have enough throw away brushes to find one when I need one. Toolbox - Having something bright and stored in the same place everyday will save you endless hours of hunting. Trust me. You'll be thanking me for this one. If you want something a bit fancier, this one is pretty cool. Ratchet Convertible Screwdriver - I'm a bit embarrassed to say I only learned about this tool's existence a few years ago. If you ever have to put together Ikea furniture, this thing is worth it's weight in gold. You're welcome! Metal Bucket - This one is probably a surprise but stick with me. Aside from it's very utilitarian uses (mopping, catching leaks, etc) you can also use these in more fun ways like serving crabs, a quick and dirty beverage cooler and a flower vase. Get a few in different sizes. So worth it. Small Hammer/Screwdriver Kit - This pretty little set can sit in a kitchen drawer and save you from pulling out the big guns when you have a small job like replacing batteries or hanging a nail for a photo. I live by the motto that I can never have enough screwdrivers and it seems to work for me. Magic Erasers - I don't use the term "magic" losely but these are the real deal. They have saved me many a paint touch up, cleaned rust stains from marble and wiped crayon from a painted surface. Get em. Kraft Paper - You already know I love this stuff. Aside from using it as paper for crafting, it makes a great table runner, covers floors and windows if you need to protect them, and makes a great space for coloring and beautiful gift wrap. I have several roles in a variety of widths. Check out my hanging kraft paper hanging roll as an example. Canvas Drop Cloths - Ok so the plastic ones are cheaper - I'll give you that. But you can reuse the canvas ones over and over. Plus they don't flap up as easily in the wind (if you're an outdoor painter like me, thats a big plus!). Added bonus - you can even make whimsical window treatments with them! So there you have it. My top 10 list that took me far longer to make than any normal person should spend on a blog list. What do you think? Totally with you on the cup hooks. I love those things. We keep our little screwdriver/hammer on the bookshelf in our living room. It's a pretty display object 95% of the time, and it's handy when we need it. I know you've stayed away from power tools, but I definitely think a good drill is essential.